En Voyage BB67628 passes south of Le Cendre with TER874009 the 14:11 Moulins-sur-Allier to Vic-le-Comte 02/05/2016. BB26073 prepares to depart Paris Bercy with the 14:00 to Clermont-Ferrande. A rail trip straight after a party was always going to be a good idea wasn't it? Wasn't it? I still don't entirely know why my alarm didn't go off, but I woke to a call from my friend to check my progress towards St Pancras. Delayed. Fortunately I had allowed plenty of time for the journey and was still able to make it to St Pancras 25 minutes before departure of our train to Paris. Slightly relieved and feeling quite ready to slump into a seat we settled into our Standard Premiere seats on 374006 our first e320. Also in the station was one(?) of the refurbished e300 sets 373016, also the first time I had seen one of these. The e320 was smooth and very bright inside and despite an initial grimace at being offered wine with my meal that was quite palatable as well! My head feeling slightly better by Paris we decided to make a very rushed trip to 'Grand Train' at La Chapelle which should have opened the previous day. Unfortunately, as since reported, it hadn't! 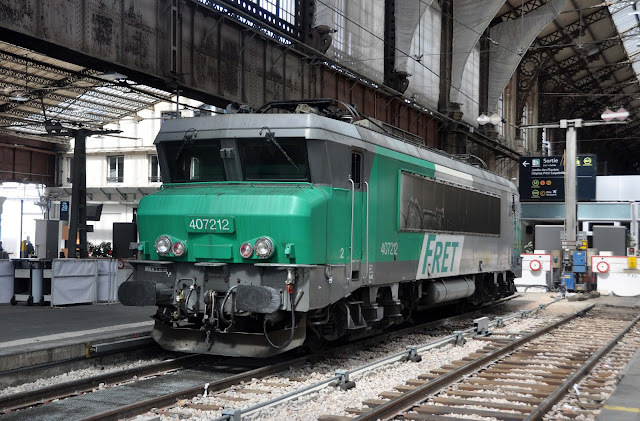 As it turns out we really wouldn't have had time to get round it anyway and we retraced our path back through Gare du Nord and down to Bercy for the 14:00 train to Clermont Ferrande with Sybic BB26073, one of only a handful which were not required! 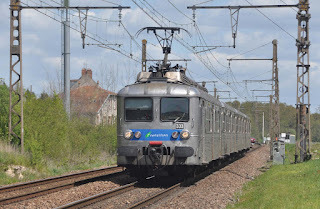 In order to try to achieve something with the day we left the Intercity at Moulins sur Allier for a fester of around an hour before picking up a TER diesel on the 19:37 to Clermont-Ferrande, one of very few Sunday turns. Fortunately this produced with BB67555 which sounded a tad quiet, not that any of the class are particularly noisy. We had a nice chat with the gripper on board who informed us that the dormant volcano (definitely not a mountain) Puy du dome had received a fresh coat of snow during the week- an unexpected plus for our photos in early May! On arrival at Clermont-Ferrande we checked into the usual hotel; Les Commercants opposite the station and then headed to our usual crepe restaurant 'Le 1513' on the other side of the Cathedral. 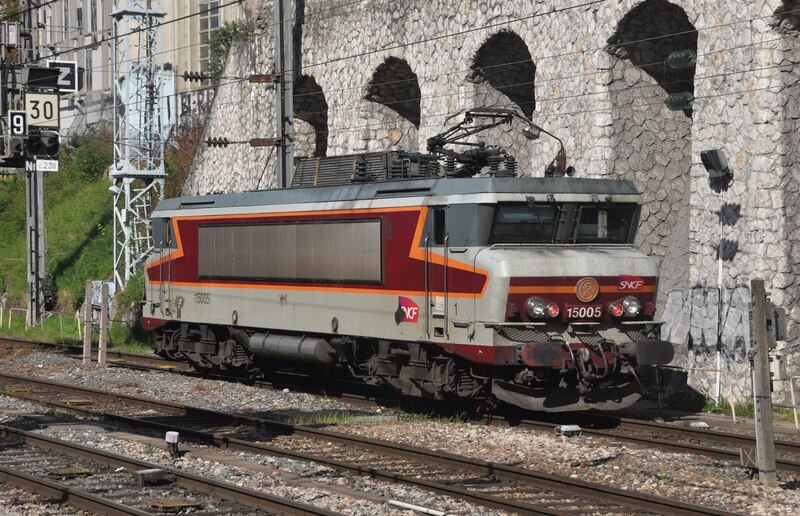 Somehow on the way to the restaurant I managed to loose my print out of the Nevers BB67400 diagrams and the simplifyer I had made for the locos at Clermont for the Monday. After the meal I was more than ready for some sleep... it would take more than one night to catch up for having had less than two hours sleep the previous one. Especially given the hour we would be getting up! Clremont-Ferrande with the 06:28 to Issoire. Don't you love it when your plan for the day has gone slightly wrong before the day even begins? We were up at 05:30 in preparation to see Saint Chely steel train with BB67400's but there was a problem- it was dark! Now it isn't dark at home at this time but we had clearly overlooked checking the sunrise time! We'd just have to hope the train ran late as chasing the train down to Neussargues wasn't an option (we'd miss the push-pull sets we were actually here for). The freight of course had different ideas and passed through the station at 06:05 with BB67563, BB67453 and, unusually shunter 8053(?). Well, we had seen a freight with the BB67400's even if we didn't have any photos. 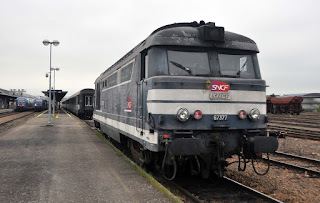 BB67556 and BB67574 pass at Vic-le-Comte. Anyway- on to what we had actually come for, some local TER BB67400 action, which we had seen precisely none of on our two previous trips to Clermont-Ferrand (both failed attempts to ride the Le Cevenol loco hauled). Having seen some previous trip reports from the area I was fully expecting several kart vices and swapping of locos on the TER's- but in a strange turn of events every train that we saw that was booked to be hauled was (I had managed to download a copy of the files I had lost to my phone). With Le Cevenol no longer being hauled six locos can cover the diagrams and these were BB67555, BB67556, BB67557, BB67574, BB67601 and BB67628. 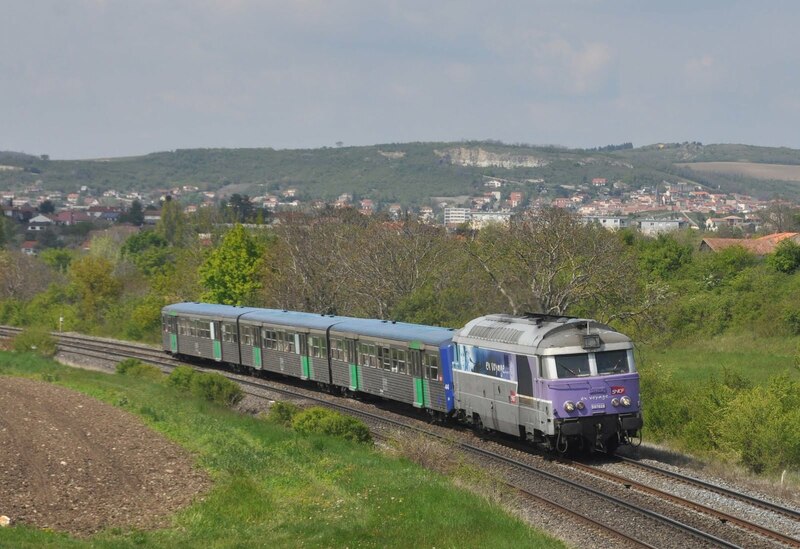 BB67574 is seen shortly after departure from Clermont-Ferrande with TER873763 to Issoire. The presence of snow at the top of Pays du Dome indicates how unseasonably cold it had recently been. 02/05/2016. All locos were easily covered and there was time for some photos as well. The sun came out and it was a jolly pleasant day- We had clearly done something right as everything went just as it should have done. Would our luck with the SNCF gods continue!? BB67556 basks in the sun as it waits for the 17:19 to Brioude. 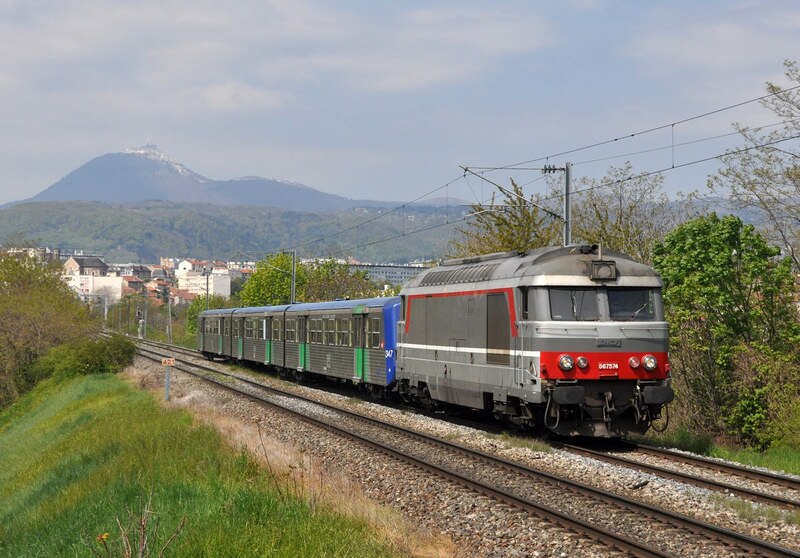 We left Cleremont-Ferrand on the 19:10 to Montlucon Ville and despite this being a 'flying bannana' unit we had a very pleasant ride along this beautifully scenic line on a lovely summers evening. Arrival at Montlucon was on time and our next move the 08:44 to Paris was already being shown on the platform for the following morning. We stayed at Hotel Le Faisan near to the station, I can't say I'd stay there again. The town was fairly dead on a Monday night but we found somewhere to get some dinner. Beautiful french scenery between Clermont-Ferrande and Montlucon. It wasn't to be. BB67377 not working our train at Montlucon. Woke up and used WiFi to check any gen and discovered that CC72084 was planned to work the 19:42 Paris Troyes... there was a target for later. Anyway, back to the original plan picking up some breakfast and heading to the station for a loco hauled run to Paris. We got back to Montlucon Ville station and sure enough the Corails were sitting in the platform as advertised the night before- but something was not right. BB67377 was sitting about a half a coach length in front of the train, cold, and this was 10 minutes before departure. Even worse- a pair of 'bananas' were sitting in the opposite platform advertised as the 08:44 to Bourges. Ah- the SNCF gods were back on form- a Kart vice. Disappointing was the word, we had come all the way to Montlucon and we weren't even going to get a diesel. With no other option we boarded the somewhat busy kart and kept our fingers crossed that there might at least be some Corails waiting for us at Bourges. Fortunately there were and BB26046 took us forward to Paris. 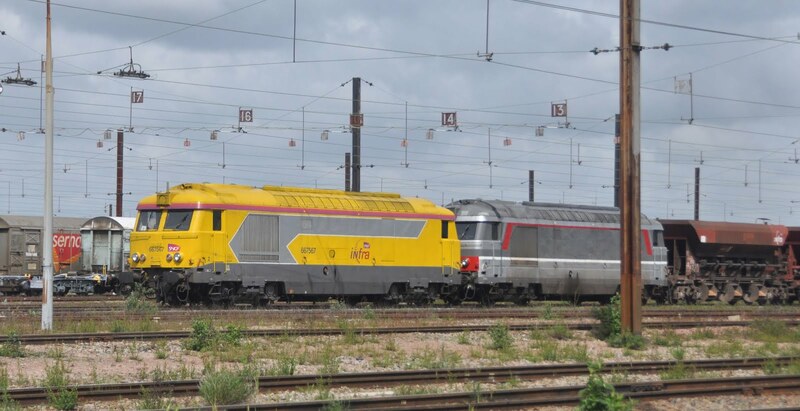 Also at Bourges were BB67330, BB67345, BB26049 and ECR 66203. BB67567 and BB67421 stabled with a train at Les Aubrais. We left BB26046 at Les Aubrais where BB67567 and BB67421 were in the yard with an Infra train. Ghostly BB75329 was also present. 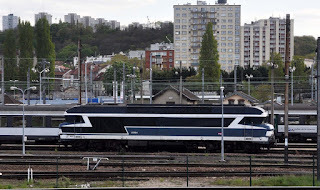 Dud BB7204 was picked up into Paris Austerlitz. Here there was a pleasant surprise with Fret liveried BB7212 on ECS duties. 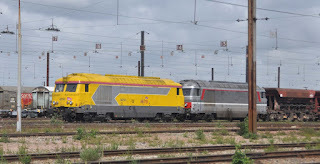 BB7212 provides a splash of colour as ECS loco at Austerlitz. Le Grande Paroisse with a service to Melun. With a few hours to kill before the diesels at Paris Est we headed over the river to Gare du Lyon where we took a unit to Melun in order to have a go at a few 'Petit Gris' on the line from Melun to Montereau. BB72046 took us back into Paris and we made it over to Est just in time to see CC72140 leave with the 16:42 to Belfort. The train unusually was right at the far end of the platform, maybe due to the recent emissions/noise complaints? Either way the front of the loco was under the road bridge making any sort of photo impossible. CC72177 was on the blocks. CC72190 was in the platform (in a more usual position) with what must have been the 18:12 to Culmont-Chalindrey- stock brought in by BB17079. 17:05 Paris Est - Le Ferte Milon 03/05/2016. 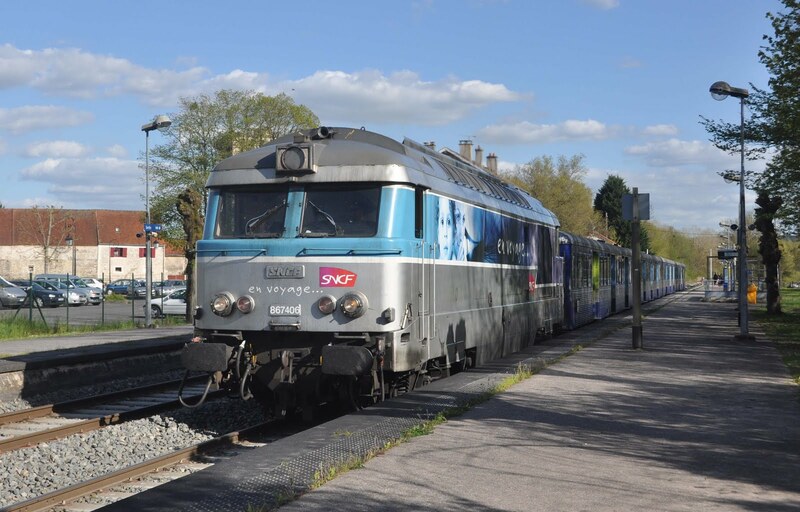 We took BB67406 on the 17:05 Le Ferte Milon with just a single RIO set. Taking this to Crouy Sur Ourcq meant we could be back at Est to see the 19:42 Troyes. 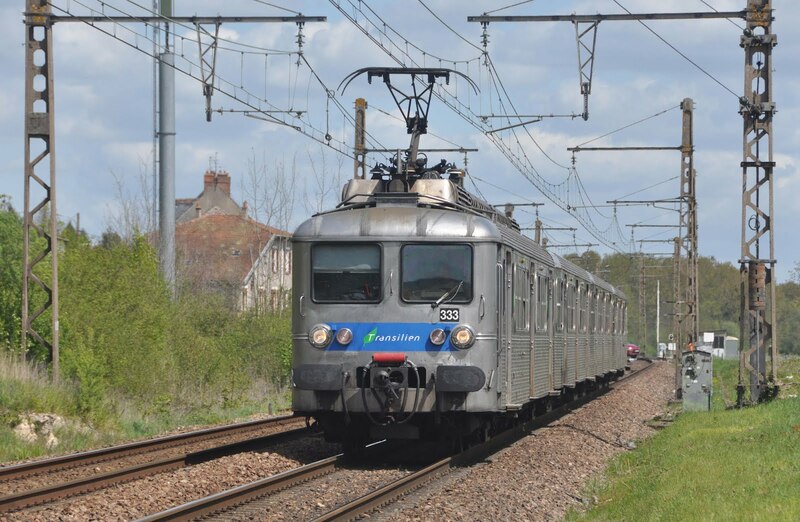 BB67599 worked the 18:05 to Le Ferte Milon with a normal 8 car set, passed at Trilport. Back to Est and we had already worked out that CC72084 was not going to appear on the 19:42- it was sitting turned off at Pantin. We couldn't see anything else to form the train however, until we spotted a Champagne-Ardenne AGC- it looked a bit cosy! 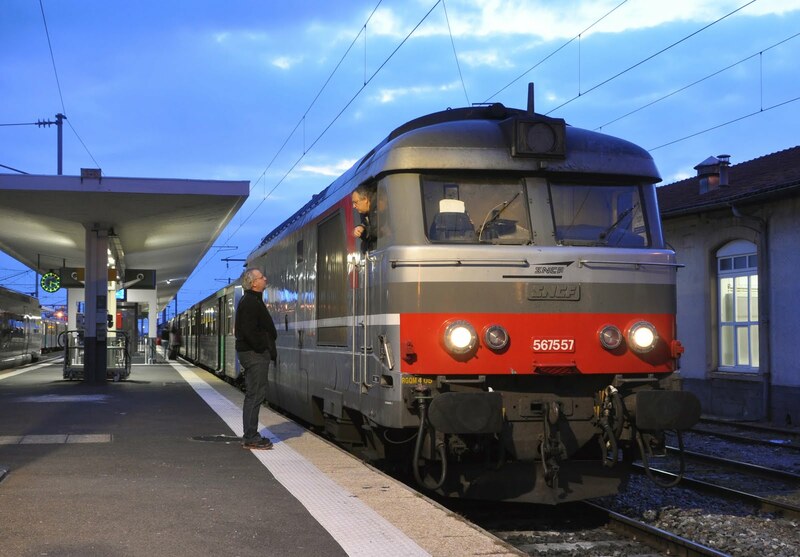 We stayed to watch the departure of BB15003 on the 19:42 to Chalons-en-Champagne. It was then time for a McDonalds before heading back to Gare du Nord for the 21:03 Eurostar back to reality, another new e320 set in the form of 374002. 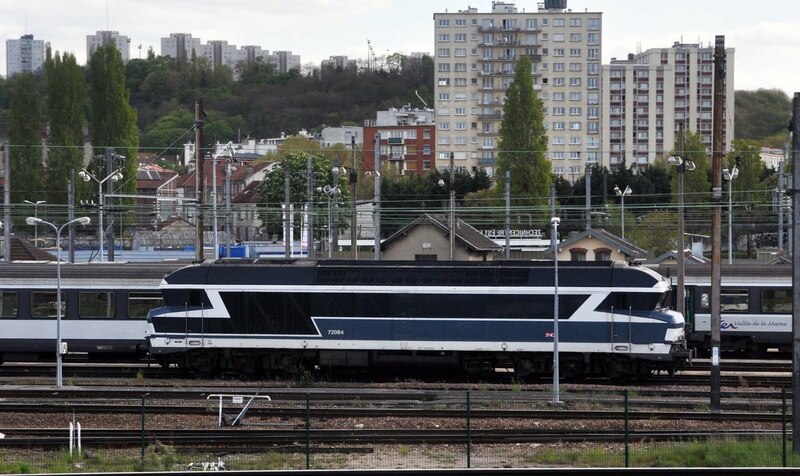 The closest we came to CC72084, stabled at Pantin. Once again France had managed to deliver some of what we had set out to achieve. The BB67400 turns out of Clermont-Ferrand are now probably the last decent concentration of TER push/pull activities with these locos and the scenery is reasonable as well. These were covered well and with some decent photos as well, unfortunately the Montlucon turns, which are very difficult to cover have evaded us which really wasted most of a day. Travel was with FIP coupons and no trouble was encountered with these, not that we were gripped very often. The only problem with photography was at Bourges where apparently it wasn't allowed- we had most of our pictures by then anyway. Taken from a passing train BB15005 in the attractive 'Grand Comfort' livery makes a fine sight outside the station as it awaits it's next duty from Paris Est 03/05/2016.